Once you have owned a brown Dwarf you will never forget him! This is a dog in a small body, but who possesses a great spirit! Let me introduce you to my kennel, Romy's Choco, and tell you how I came to be in Poodles. Love towards dogs is kind of a tradition in my family, and it has been passed through the generations. We have always had canine friends, and I grew up with a dog. We acquired our very first poodle in the early 80’s – a white Miniature Poodle female called „Rita“ - and since then I love white poodles and Poodles overall. Rita was kind of my guinea pig. I learned with her how to groom, breed and look after a dog in general. At that time I was only 10, but it was just the beginning. 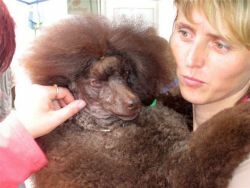 As I gained more experience, I met many interesting people – poodle breeders – and I started to think of acquiring a pedigreed poodle. I wanted to learn more and gain additional experience. So I proceeded to check on various litters of puppies, visited many exhibitions and tried to make up my mind what poodle size and color I should choose. I hovered between Miniature black and white (being strongly influenced by our Rita). However, on the day I saw the first brown Dwarf poodle, and puppies later on … the question of which size and color was quickly resolved. Why just the brown Dwarf Poodle? I don't recall exactly, but I would say that besides the beautiful color, it was their vivacity, self-confidence and intelligence which claimed my affection. I am a sporty, optimistic and vivid person myself, so it made perfect sense to choose the dog that fit my temper best, i.e., the brown Dwarf poodle. They are very intelligent creatures, very sporty and fond of exercise – they love retrieving and are able to walk and run for kilometers. They are good comedians too, their drollery will accompany you all their lives, often of quite great age. I acquired my first brown dwarf in 1990, a little female registered Brown Chaellie z Jicinskeho zamku (nicknamed 'Seli'). Seli’s acquisition marked the start of my first real exhibition, clipping and breeding experiences. Seli's first breeding was to Ignac z Jicinskeho zamku (sire: ITCH. Ziron Brown Mandelblüte an der Bergstrasse, dam: Biggi v.d. Listigkeit). Seli's first litter was born in 1993 and consisted of the following puppies: female Ayola, males Awry and Agry from “Plyšové štěstí” /Plush Happiness/ (my first breeding station). This litter was quite successful and I started to think about using a male from abroad. I started searching for a handsome (and frankly, brilliant) male. But where to find him? After visiting a couple of European exhibitions, I quickly realized that this would not be an easy task. There was a desperate lack of high-quality dogs. So what about Brown Poodle kennels? In Europe I could count them on the fingers of one hand. That is when I decided to specialize in the breeding of brown Dwarf Poodles, with the focus being not only on producing beautiful, sound and healthy dogs, but also in helping to increasing their numbers in Europe. At the Luxembourg, European Dog Exhibition in 1993 – fortune finally smiled upon me. 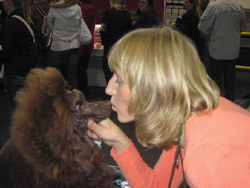 It was there that I met Marion Caminos-Epperson from Belgium – a breeder of brown and black Miniature Poodles. Ms. Epperson’s kennel prefix is “Timari”. She had with her that day a beautiful brown Dwarf dog, bred by her, named Timari Q' Bolero (nicknamed B.B.). You can see B.B on this web site, too. We became friends and, in the Fall of 1994, Seli was bred to B.B. for her second litter. She delivered four beautiful puppies: Nougat Naomi, Noisette, Nutti, N´Bolero (B.B. Jr.) z Jicinskeho zamku. This litter was very successful. I retained the female puppy Naomi from this litter. This is where my breeding station ROMY'S CHOCO started, which coheres with the kennel z Jicinskeho zamku. My kennel is aimed for breeding superior quality, healthy puppies, for exhibiting and also for grooming and lifting. When selecting prospective studs for my dams, I seek to avoid tight breedings and look for the soundest and healthiest sires, that will compliment my dams. In my efforts to increase the number of superior breeding stock, various sires have been very carefully selected, and are predominantly outcrosses. Most of the sires that I’ve used in my breeding program have come from abroad. By using outcrosses, it provides me greater versatility in my breeding program and keeps my gene pool flexible, strong and healthy. All my dogs are genuine family members. They live in the house with me, follow me almost everywhere, and without exception they all receive plenty of exercise, which they love and need. Our puppies are brought up with great love and care, and their happiness and well being is a family endeavor. I am very careful in selecting kind new owners who are able to provide my puppies with the best living conditions. I remain in close contact with new owners and am ready to offer help with lifting, upbringing and breeding or any other advice. Breeding and exhibitions are not my priority when selecting new owners. However, due to the lack of high-quality dogs, I am always glad when a puppy that I have bred can be used in future breedings. With regards to exhibitions, I can say that brown Dwarfs are very self-confident dogs and love show walks. Being the center of attention is a big reward for them. Some people think that exhibition dogs suffer, but this is not true about brown Dwarfs. I wish you could see my 'Poodle kids' when I get ready for a show. They run wild when I get them ready for an exhibition and take out our all the outfits and equipment. If my chatting and pictures have captured your attention to the point where you think you would like to have a puppy from our kennel, please feel free to contact us. You’ll be glad you did. Brown Dwarves are merry, vivid, kind and intelligent companions that you will be able share many happy moments with.